TEMPORILY OUT OF PRINT. SORRY! It may be a while before I reprint this, but you can purchase a digital copy from Bandcamp. "A marvelous recording that will stand as one of the best Seattle CDs of the year." 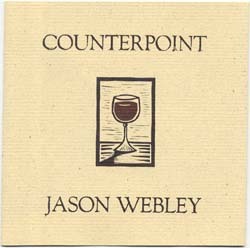 Richly orchestrated and stylistically diverse, 'Counterpoint' is a seventy minute meditation on parallels and contradictions. The music movies from an homage to Leonard Cohen to a bavarian drinking hall, from big-band zombie swing to a baroque fugue in the blink of an eye. For this album Jason is joined by some Seattle's finest musicians, including: Michael McQuilken, Jherek Bischoff, Reggie Watts and Eyvand Kang. With: Jherek Bischoff, Fred Hawkinson, Jon Hyde, Eyvind Kang, Olli Klomp, Gary Luke, Adam McCollum, Andrea McCrady, M.D., Michael McQuilken, Paulo Cesar Alves Pereira, Harry Pierce, Greg Powers, John Schurman, Josh Stewart and Reggie Watts.